s natural healing abilities following treatments for oral conditions, including periodontal disease. 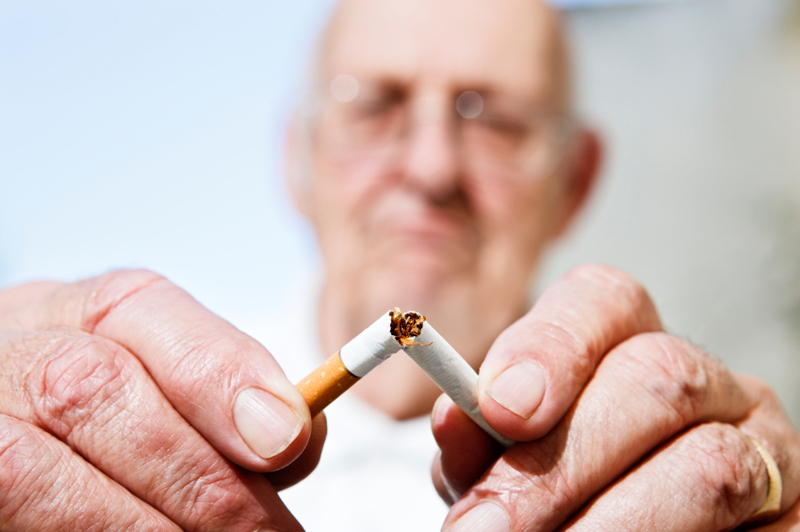 Quitting smoking can significantly reduce risks associated with periodontal conditions and potentially increase the effectiveness of treatments for oral conditions. Nicotine has shown to have an impact on many factors that may contribute to the development of oral health conditions. Gingival blood flow is restricted, cytokine production is limited, and cell immunity is impacted by nicotine use. After quitting smoking or otherwise using nicotine, these issues may take time to return to normal functioning, so risks may remain high for a period of time. Tobacco use has been associated strongly with poor oral health. Gum pocket depths are often increased as a result of tobacco use of any kind, allowing greater buildup of calculus within the pockets. Bone and tooth deterioration has been associated with long-term tobacco use, as well. Cancer of the mouth, lips, pharynx, and larynx may also be caused by smoking. which may cause a delay in diagnosis. In non-smokers, periodontal disease can be easily identified by the presence of symptoms such as bleeding, redness, and inflammation of the gums. In smokers, the blood flow to the gums is constricted, so these symptoms may not appear when periodontal disease is present. This can cause periodontal disease to progress without detection for a time. Certain oral conditions have been linked to smoking. While periodontal disease has been loosely associated with smoking, as well as other factors, some conditions have been more closely correlated. Acute necrotizing ulcerating gingivitis and nicotinic stomatitis are both highly characteristic of smokers. ANUG is characterized by extreme redness, protruding papillae, and spontaneous bleeding. In some cases, the temperature of the gums may also be elevated and swelling of the surrounding lymph nodes may be present. In most cases of ANUG, extreme stress and smoking are both present; although a causal relationship has not yet been established. ANUG is often treated using mechanical debridement and antibiotics. Nicotinic stomatitis is characterized by a wrinkled or cobbled appearance of the palate. Prominent mucous glands may be visible, as well as inflammation and mottled redness. After quitting smoking, lesions and the effects of irritation have been shown to subside noticeably. To take control of your periodontal health – and your overall health – utilize all the options available to live a smoke-free lifestyle. If you’ve suffered periodontal damage, call us to help today.